Friday I was cutting down a dead walnut tree (full of barbed wire fence... and bullets I later discovered at the sawmill.. but that's a different story), and the walnut brushed the branches of a maple tree as it fell. Immediately, it started raining dew drops beneath the maple tree. This dew was curious, because it was 3:00 in the afternoon. So I stretched out my hands and caught some of the drops falling from the maple tree. Then I tasted them... just as I suspected... sweet sap! Two years ago while scouting for timberframing tools in a New Hampshire antique store, I came upon a book called Backyard Sugarin . This neat little book shows everything you need to know to make maple syrup (without spending any money! ), starting with identifying a maple tree (by its leaves) to boiling your sap. I resolved some day to try and make maple syrup, but soon forgot my sappy resolution in the pursuit of my timberframe house. Well, having sap rain on my head was surely a sign that now was the time to try my hand at sugarin... house or no house! 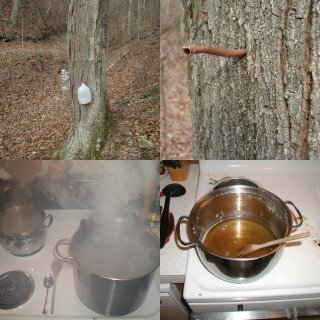 Within 6 hours of tapping Old Faithful, it put out 6 gallons of sap, and by 1:00 am Saturday morning I had boiled it down to about 14 oz of maple syrup. Saturday morning we had homemade waffles with homemade maple syrup. To me, it tastes better than what used to buy in VT and NH. I tapped 8 more trees Saturday, but none have been as prolific, as consistent, or as "faithful" as this first tree - hence its nickname. With nine trees now trickling buckets of sap for at least several more days, my wife has volunteered to take over the syrup production so I can get on with the house. 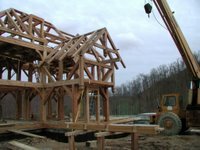 How does this relate to building a timberframe home from scratch? 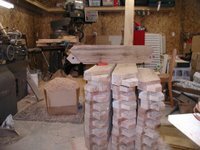 Well, in the process of logging and sawing my own timbers for the house, I learned from "logger friends" how to identify a sugar maple by its bark, and that is somewhat important since sugarin season occurs when the trees have no leaves. We have three large sugar maple timbers in our house (as well as some smaller joists and braces). To me, the wood when sawn and planed looks like cherry, without the cherry color. In any case, now I have another reason to appreciate maple trees! Rafters on the cantilevered gable. Thursday and Friday we worked on the "cantilevered gable room". Basically, this is a room with a vaulted ceiling that hangs out over the 1st floor room by 2 feet. Pendants hang down from the 2nd floor posts and from the roof truss. I really like how the cantilever and pendants turned out - if I had it to do over, I think I would have extended the cantilever even further (maybe another 2 feet). Only the last rafter pair had a collar tie. In order to fly the other rafter pairs, we nailed a temporary collar tie (oak 1x3) into each pair, and removed them after the rafter feet were solidly planted on the top plates. Before flying in the last rafter pair (actually a truss since it had a collar tie and king post), we fitted the ridge beam. This truss then "slid" onto the top plates and into the ridge beam. It was getting late Friday and we felt like we had accomplished plenty, so we'll wait til Monday to peg it all in place! 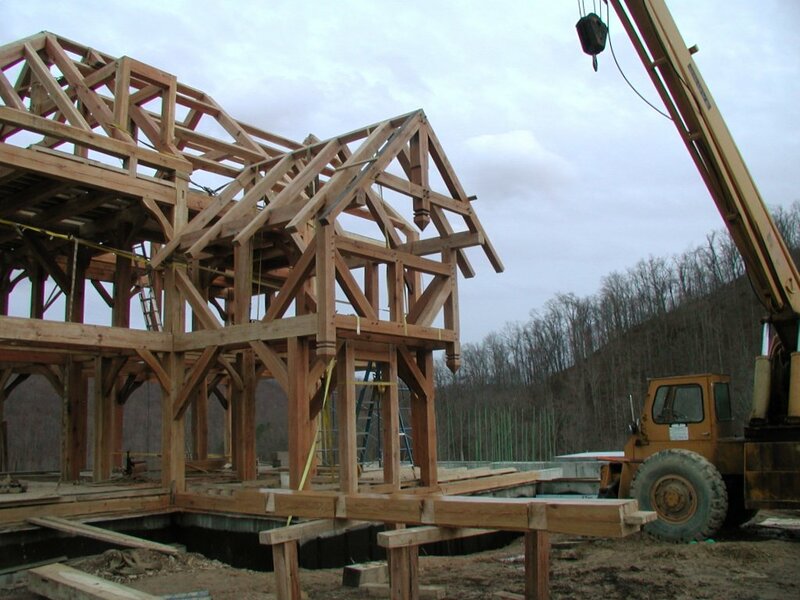 Summary: This is a great book on how to build a timberframe house. Shows you how to: draw a floor plan, design your (simple) joinery, chose tools, pick timber sizes, raise the frame by crane or by hand. Benson has 3 books that I know of on timberframing - this is his first and is aimed more at the self-builder type than any of the other 3. The illustrations in this one are so good that even if you couldn't read, you could probably figure out how to build a timberframe from the pictures alone. Don't borrow this book... buy it. Summary: The title, content, and quality of this book is very similar to Ted Benson's book above. However, this book goes further than Benson in one very important regard. Sobon includes a chapter entitled "From Tree to Timber," that you will find invaluable if you're wondering what kinds of trees in your woodlot might be suitable for a timber frame. (You will not find this depth of information on selecting trees in any of Benson's 3 books). Whereas Benson seems to be reinterpreting the craft of timberframing, Sobon more faithfully follows the methods of traditional timber framing. For example, Sobon dedicates several pages of the book to describing the method of hand hewing timbers (sorry, too much work for me, I skipped those pages!). Don't borrow this book... buy it. Summary: If you're wondering what's the difference between this book and Sobon's other book - the answer is not much. They share 99% of the same DNA. They're both great, self contained manuals on how to build a timberframe structure - from the woodlot to completion. Like Sobon's other book, this one includes a chapter on picking your trees. However, this book is centered around building a garden shed, whereas Sobon's other book is centered around building a house. Buy either of Sobon's books (based on whether you want to build a house or a shed) for yourself and skim the other one at the library. Summary: This book won't tell you how to cut joinery, chose your tools, or raise the frame. 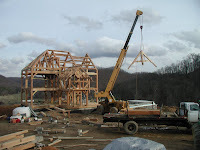 It will however give you enough information in order for you to chose a timberframe company that can do all of that for you. More importantly, it will show you how to take the frame and turn it into a house. 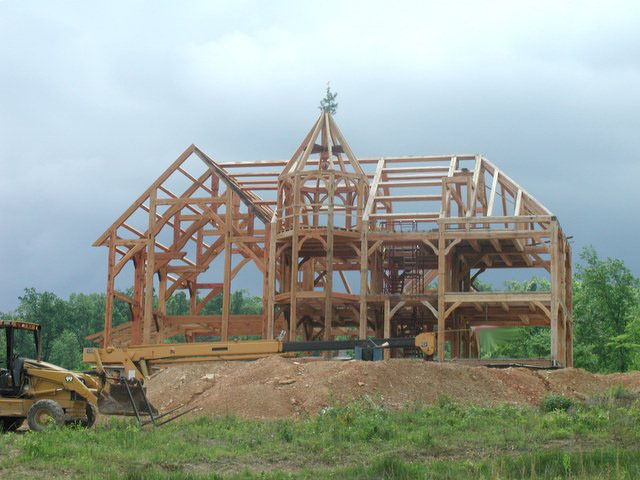 Covers nearly all of the idiosyncracies of finishing a timberframe home. Great chapters on SIPs (Structural Insulated Panels), foundations, electrical wiring, and plumbing. If you're building a timberframe barn, shed or cabin, you might not need this book. If you're building a timberframe house (or having one built for you), you absolutely need this book. 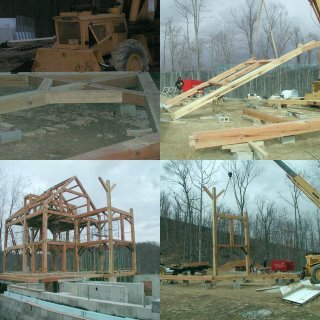 This is required reading for anyone who wants to be or to hire a general contractor for a timberframe house. Summary: This book is a collection of 32 Fine Homebuilding articles about timber framing. If you know nothing about timberframing or everything about timberframing, this would be a great book for you to learn more about timberframing! 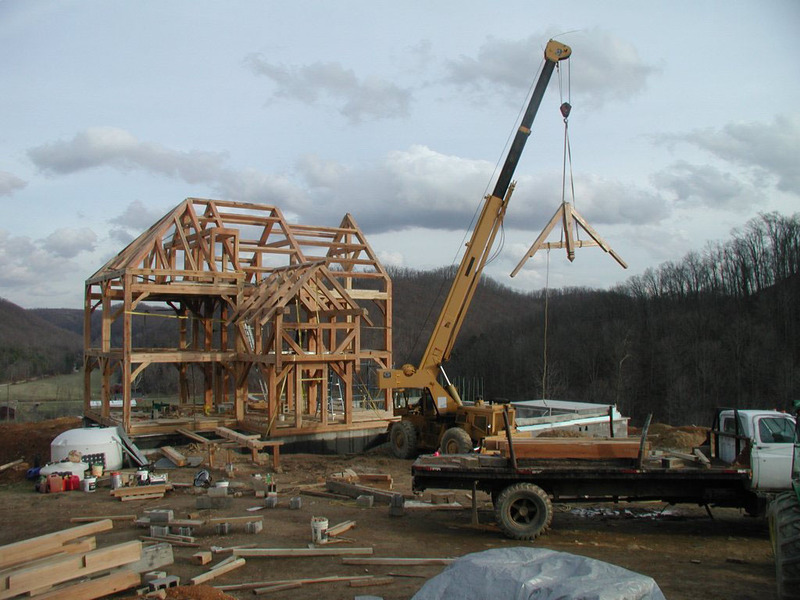 Some of the articles cover aspects of timberframing you will not find anywhere else. For instance, there's an article by Don Price that showed me how to build my basement and foundation so that I could face my timberframe house with real stone. There's also an article by Christopher Hyde that shows the best (only?!) detail on a timberframe hip roof that I've been able to find in any book anywhere. I don't know if this book is still in print - I found my copy on ebay. Definitely worth buying no matter what your timberframe angle is. Summary: This book is a collection of showcase houses. All of the houses feature exquisite craftsmanship and details. If you're looking for beautiful pictures, design ideas, and inspiration, buy this book. If you're building you own timberframe house from scratch, save your money and buy a nice sharp chisel. If you have a million dollars to spend on a timberframe house, buy this book first, so you know better than to buy a Yankee Barn Homes house. Summary: Riverbend has some of these best timberframe homes that I've seen, so I sprang $25 on their corporate planbook. Wow, I was surprised. 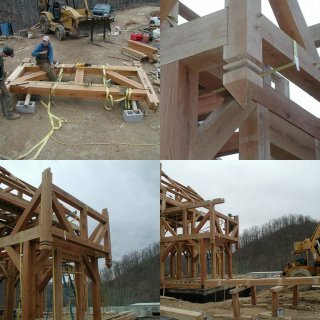 The pictures are breathtaking and the book has useful information on planning and scheduling your timberframe. Each of their home plans includes a sketch of the bent design used for the house. Although this is unabashed corporate marketing, I'd put it on par with Benson's coffee table book. My wife and I kept flipping back to this book when we were looking for ideas for our house. Summary: Similar to Sobon's books or Benson's first book in that it covers nearly all aspects of building a timberframe structure. More of a "workshop workbook," lacking the polish of the other timberframe books. Tries to be a little more rigorous on the engineering aspects of the structure. Steps you through some calculations of trusses. I found the book helpful while making joinery decisions for my frame. I bought the book largely for its discussion of hammerbeams (a subject that Sobon and Benson do not go into), but I found Chappell's description of the physics at work in a hammerbeam a little too simplified (if not flawed). His simplification of the hammerbeam is a conservative one, and will result in an overly conservative hammerbeam design - which is not necessarily a bad thing. In the back of the book, he has several sample timberframe designs (minus the actual timber drawings) that could be helpful. Buy this book if you have read everything about timberframing and feel like you want to hear another voice. Otherwise, just buy Benson and Sobon's books and leave this one at the library. Summary: A picture book worth thumbing through for ideas and inspiration. If you already have a timberframe home and want to redecorate, this would be the book for you. Mostly good ideas, but there's at least one gawd-awful picture of a timberframe painted white - I can't believe the authors really think it was a good thing for the homeowners to do that to their timberframe. Summary: I didn't know what to make of this book when I got it. I still don't know what to make of it, and by now I've lost it. I don't remember gleaning anything particularly useful from this book. Describes an odd type of construction with vertical posts, infilled with logs - without much reference to the more used forms of timberframing. It just wasn't what I was looking for, but I don't want to be too critical because someone else might find it useful. Rating: 0 out of 5 - don't spend your money on this one! Summary: This book is a collection of pictures and floor plans of various houses built by Yankee Barn Homes. Very disappointing. I plan to sell my copy on ebay. List price is $39.95, but I wouldn't buy it at any price if I had it to do over again. Perhaps you would find this book useful if you like the yankee barn homes style of timberframing (no corner braces, no visible joinery, no visible floor joists, hidden and not-so-hidden metal fasteners, etc.). Yankee Barn Homes also offers what they call a design guide (three ring binder with corporate marketing) - don't buy that book either. In the timber framing workshop at Grand Oaks, Scott tried to let us cut as many different types of timber framing pieces as possible. 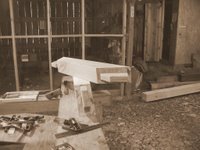 On the third day of the workshop, I was to cut some braces for the cabin frame. It took me an entire day to cut only two braces. In the back of my mind, I was thinking about how many braces would be in the house I wanted to build... 130 braces, divided by two per day = 65 days just to cut the braces for my house! Of course I would get faster as time went on, and surely I could employ some shortcuts, but my wife was also adament that our braces have those arches in them "like the ones in the magazines!" That would surely add time to the estimate. In any case, this would be repetitive work and would take a long time. In my workshop at home, I had an old Super Max milling machine... a Taiwanese knock-off of the classic Bridgeport milling machine. It was retrofitted with a circa 1984 CNC system that I had never used for anything other than a digital readout. (and gee whiz, you could even save your programs on this machine if you had a cord to connect it to a cassette recorder). The machine was a free worn out hand-me-down from a company that wanted to get rid of it several years before. (you can buy a machine like it on ebay for probably $1,500) The gears were turning in my head... could I possibly program this machine to cut braces for my timberframe house? The first time I fired up the machine and started the program I had entered on its keypad, the ol' Super-Max squealed, vibrated, screamed, and shuddered as it drove the 1" endmill trough the wood. The bit got duller and duller as the program executed. Eventually, smoke was rolling from what was minutes before a shiny new endmill. I manually overrode the feed rate, so that now the program was executing at about 1/10th of its intended speed. My spirits sank as I backed away from the howling machine, certain that something would break, but determined to see this first try all the way to its end. The very last step of the program was a command to drill (vertically) a hole for the peg in the end of the brace. Lo and behold, the machine executed this last step as if it were milling butter. Eureaka! We're back in business baby. The key to making the milling machine work was not to mill a path sideways through the wood, but instead to approximate the shape I was trying to obtain by executing a series of vertical drilling operations... then and only then mill sideways, cleaning up the small bumps that resulted from the drilling operations. Connect the dots if you will. 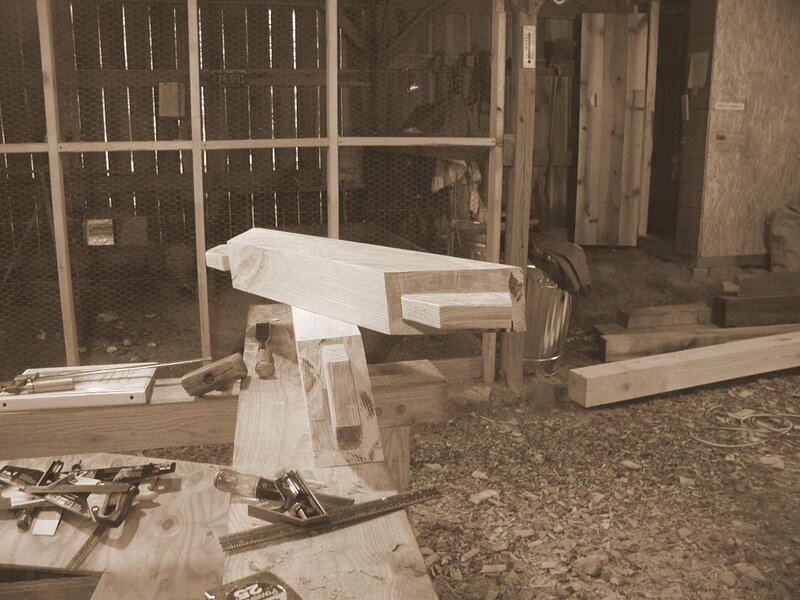 Ironically, this is how the old timberframers made their mortises (and how we were taught in the class) - they would drill into the wood, and then use a chisel to form their approimation of a mortise into a nice square mortise. I made over 130 braces this way on my milling machine. Each brace required 3 programs, and each program took about 15 minutes. 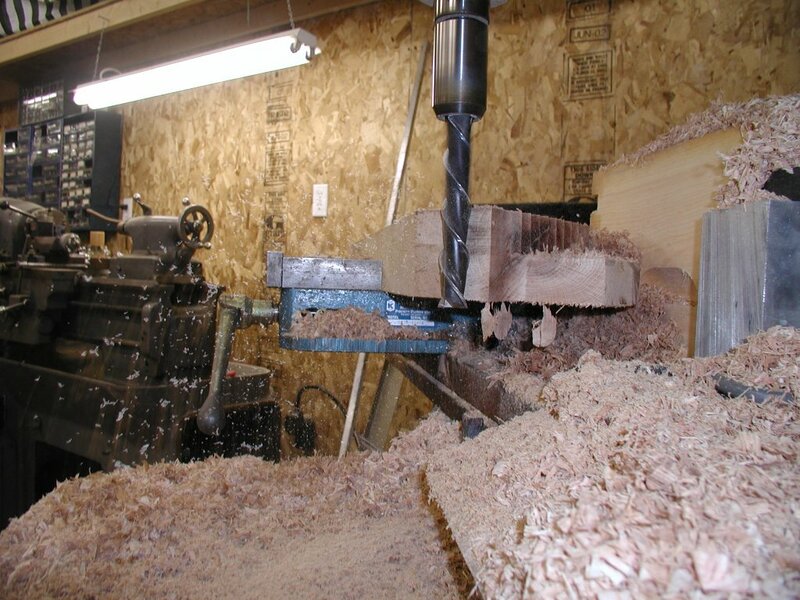 That's about 10 days of milling - I estimate this machine saved me about a month of repetitive work. 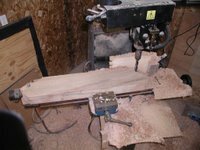 What's more, when the program was running on the milling machine, I was able to surf the internet 15 minutes at a time, looking for more information on timberframing! Where precision matters the most in a timberframe (the braces), I was able to achieve a very high degree of precision. When the CNC mill finished the very first brace, I slapped some Minwax polyurethane on it and ran to the house to show my wife. Here it is, still wet. First we aligned, tweaked, and assembled Bent D on the ground (upper left picture). Because there was only one girt going from post D2 to post D3 (seen laying on the ground in the upper right picture), all three posts of bent D were not stable to "fly" with the crane as a single assembly (unlike previous bents A,B, and C). Of course, Bent D is a much more rigid assembly if the truss (rafters+collar tie+king post) is included and we seriously considered flying the whole shebang, but I did a quick calculation and estimated that this bent weighs somewhere close to 4,000 pounds with the truss included. Then I looked at the load chart for my 1974 model Grove crane, and realized that at the distance we were going to be lifting from (about 45 feet) this load was on the hairy edge of barely possible. (Although this is a "15 ton crane," you can't lift even 1 ton when boomed out 60 feet!) Better safe than sorry, so we decided not to even try and lift the whole thing. So, we drilled all of the peg holes for this entire bent while it was on the ground, but we drove pegs only in the subassembly that we intended to raise first. This subassembly flew quite nicely (lower right picture), even though it was assymetric. Why? Because the big tall post on the left is yellow poplar (D2), whereas the shorter post on the right (D1) is oak, and even with the big maple braces at the top of it, the poplar post did not weigh more than the oak post. 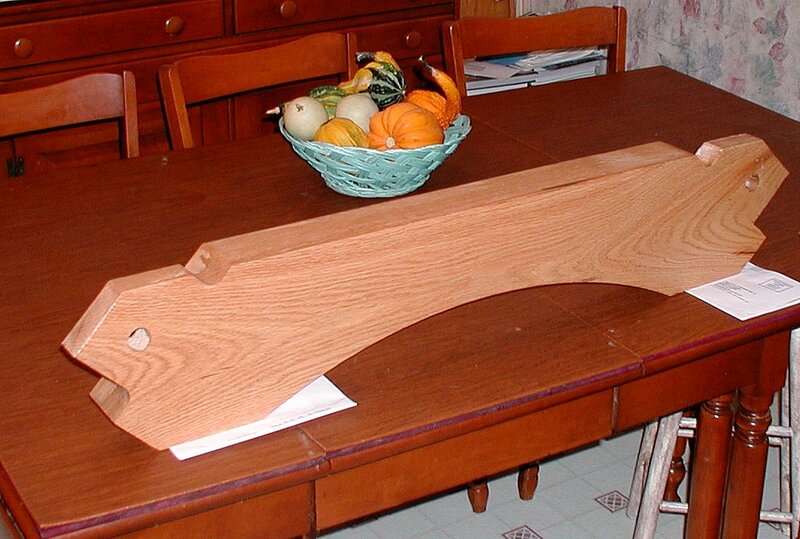 (For what it's worth, the top girt in this assembly is also hard maple and the lower two braces are walnut - everything else is oak). In the final picture (lower left) you can see that everything came together by the end of the day. All we need to do now is to fly in post D3 (and the 3 girts that connect it to the rest of the house), and then lower the bent D truss on the tops of the bent D posts. We have put very healthy chamfers on the tenons on the tops of those posts - in the hopes that the truss will just sit down nicely when we get to that point.